I was downtown yesterday meeting a guy about thing. I had my camera with me so I grabbed a couple quick shots. The weather in Calgary this winter has been pretty good lately. As you can see from the pictures it’s not exactly what comes to mind when one thinks of winter in the city. It was 48 degrees (9C) in Calgary yesterday and it looks to be staying around that mark for the next little while. That is good photography weather and I plan on taking advantage of it :). 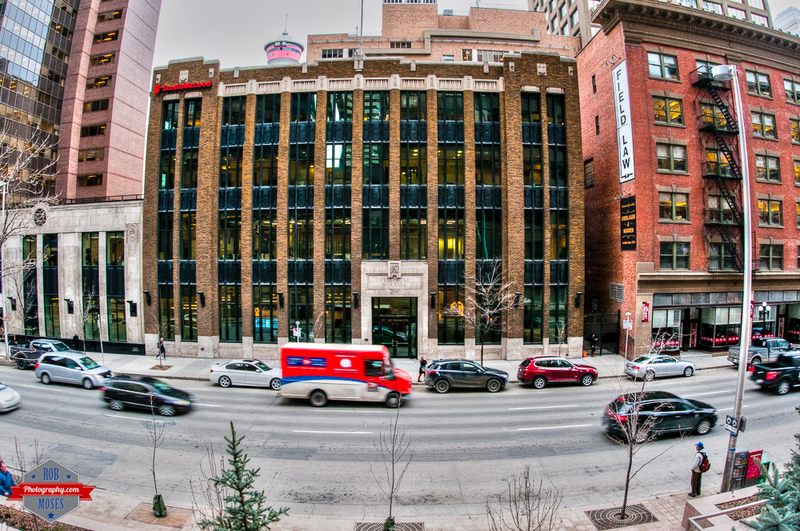 This entry was posted in Uncategorized and tagged 15mm, Alberta, architecture, beautiful, bow, building, buildings, cab, Calgary, Canada, canada post, cars, city, City Life, cloudy, D300s, fed ex, fire escape, fisheye, glass, mail, metro, mild, modern, new, Nikkor, Nikon, office, old, overcast, Photography, pretty, prime, Sigma, skyscrapers, socia bank, street, taxi, tower, traffic, truck, Urban, Weather, windows, winter, yyc. Bookmark the permalink. Okay, how many cameras do you have? 🙂 Love that fisheye capture. 4 DSLR’s, 2 mirrorless & 5 SLR’s LOL. Hmmm, sounds kinda stupid when I see the numbers written out like that 😬. LOL, good call! Cuz I don’t even know haha. I just gave one of my DSLR’s to a friend of mine too haha. LOL, your number one on the my list buddy ;). Rob, you crack me up! That’s a whole lotta cameras! !